Boston Rugby Club’s under 16s earned a 27-26 victory ay home to mansfield - courtesy of a last-minute try. The hosts agreed to loan some players to the away side, who were only able to bring 13 players, however this almost proved to be a costly decision. Boston sought to use the game as an opportunity to give game time to inexperienced players who missed out in the recent NLD fixtures. Mansfield started the brightest, scoring a try within two minutes, before kicking th conversion. This only motivated the Boston players who applied pressure and, in the 13th minute, Tom Hobbs continued his fine scoring form with a try following a line break in his own 22. Boston made changes and brought more experienced players into the game. In the 26th minute Joby Ancell scored his first try for the club by picking up the ball from the breakdown and driving through tackles to score. Boston made changes again at the start of the second half, but things didn’t quite go as planned. Ryan Cuthbertson was asked to briefly fill in at full back for Mansfield. In the 38th minute the ball reached him in the line only five metres out and one sidestep later he had scored for Mansfield. Boston rallied from this and, three minutes later, scored again when Louis Williams was able to force his way over for an unconverted try. The 46th minute was a turning point in the game when Ancell was shown the yellow card for an off-the-ball tackle. Unfortunately for Joby, the card was shown to the wrong player with Emanuel Araujo actually being the player who committed the offence. In the 48th and 54th minutes, Mansfield scored two tries, one of which was converted, giving them a 26-15 lead. With the game entering the final 15 minutes, the Blue and Whites returned to a full complement of players - and that made all the difference. Boston got back into the game as Joe Langford scored following a scrum and Tom Hobbs converted. In the final seconds of the game, Boston won a scrum against the head five metre out and Langford was able to cross the line to earn the victory. 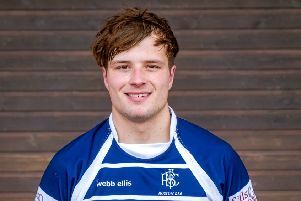 Toby Scott was names as the man of the match for his captain’s performance. BOSTON: Allen, Ancell, Araujo, Baker, Baxter, Clark, Colson, Cook, Cuthbertson, Farmer, Gray, Hardstaff, Hobbs, Langford, Little, Moody, Raggo, Scott, Scuffham, Stones-Blackman C. Taylor, Williams.